The Home for RC Planes, Gyro Planes, Stirling Engines, Steam Engines, Steam Planes, 16mm Live Steam Locos, Twin Hull Steam Boat, Indoor Planes, Garden Railways. Lazy Bee on a Puddle. 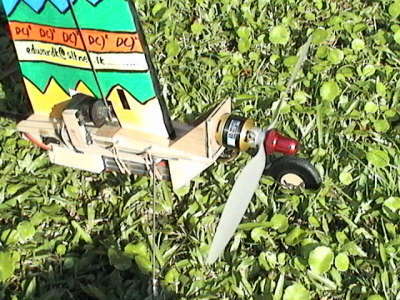 This is a Direct Cotrol Electric Gyro Plane. It is powered with an AXI Motor. The tail boom is made out from a carbon fiber tube. 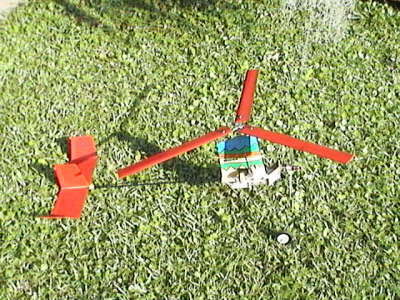 The rotor pylon is costructed with balsa and cardboad. Balsa wood was used to construct the three blades. 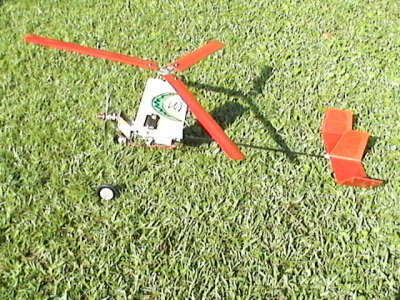 It was quite easy to fly this model. Disorientation is some times is a problem. An AXI Motor was the power plant and a 12.6v 1500 mAh. battery supplied the power. The flight duration was appro. 12 min. Today, there have been 4 visitors (14 hits) on this page!